The Boston Red Sox and Tampa Bay Rays are currently doing battle for first place in the AL East. The Rays entered the three game series against Boston up .5 game, but things could be quite different after these three games. In game one, a late rally by the Red Sox came up short as they stranded the tying run on third in the ninth and fell to the Rays 5-4. Even though a simple flyout hit a catwalk and turned into a double and Rays’ closer Troy Percival hurt himself backing up third base, Boston could not get the big hits and could not take advantage of those strokes of luck. Unlike, previous seasons the Sox can no longer consider Tampa Bay as “Fenway South”. For the first time in their history, the Ray fans outnumber the Sox fans in Tampa Bay. The Ray fans are finally proud of their team and showing up to the ballpark. They had a record crowd yesterday and had the best ratings for Rays’ TV in their history. It’d be tough to find a person who is unhappy with Tampa’s new-found success. The team struggled for so long and they played day after day without fans and without hope, but now that they have finally broken through, I don’t seem them going away anytime soon. They have a young pitching staff and a solid bullpen. That’s not to mention their lineup, which though not overpowering, does pack a punch. Carl Crawford is still young and his best years are yet to come, though he seems to have gotten a step slower. BJ Upton and Evan Longoria are both terrific and are extremely young. The team is inexperienced so I’m not sure they can play this well for a 162 game season or handle pressure late-game situations in September. I think the Red Sox will win the AL East eventually, but not easily. 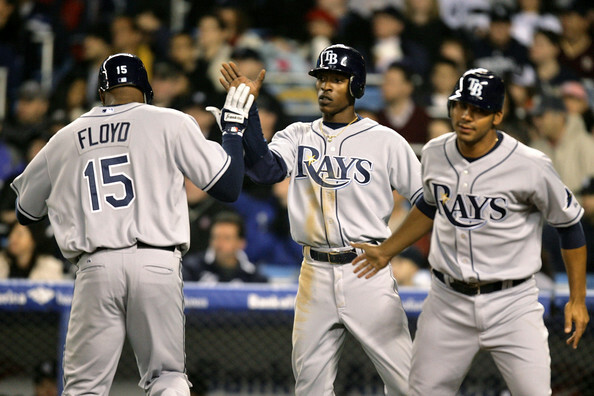 If they don’t win the AL East, the Rays have a great shot at the Wild Card. I don’t see any other non-division winner really giving the Rays a run in the Wild Card. First off though, they are shooting for the AL East and that begins with the Red Sox and this three game series in Tampa Bay. Not just are these two teams fighting for the division lead, but they also are fighting each other, literally. In the previous series, Red Sox outfielder Coco Crisp charged the bound against Rays’ starter Jamie Shields. Crisp avoided a massive hook from Shields before being tackled by Jonny Gomes and repeatedly punched by Gomes and other players. Crisp and Tampa Bay manager Joe Maddon had shouted at each other from across the diamond in the game before the brawl after Crisp seemed to have slid hard into second base. Neither team was particularly happy with each other and that anger boiled over in the final game of that series. However, Red Sox closer Jonathan Papelbon hinted that thiswas not over when he said that “this thing isn’t all settled and done”. If you aren’t tuning in to watch two of baseball’s top teams, then tune into watch another fight possibly break out. More to come later on my 2008 MLB playoff predictions!